To play, you will need: four sets of 18 Army tokens and 3 City tokens (each set a different color for each player). You may use anything small that you have available. The published game will use small wooden cubes for armies and small wooden discs for cities. Choose one player to set-up the board. Place the four map boards together on a flat surface so that they make a large rectangle. If playing with 2 or 3 players, only place three of the map boards (they can make an "L" shape or you may place them side by side to make one long rectangle). A. It has one water connection to another continent. B. It is adjacent to a region that has one water connection to another continent OR has an additional water connection to another continent. Set aside the card labelled "Card Cost". If playing with 3 players, go through the cards and remove the cards with the little number "4" in the top right corner, just below the scroll on which the good is displayed. If playing with 2 players, also remove the cards with a little number "3". Shuffle the remaining cards and place them in a deck face down next to the board. Draw six cards and place them face up in a row along the top of the board. Place the "Card Cost" card just above the row of cards. Each player takes a set of one color of 18 armies (cubes) and 3 cities (discs). Each player places 4 armies on the starting region on the board. If playing with 2 players, each player takes turns placing one army at a time of a third, non-player color in any region on the board until ten armies have been placed. Place the coin tokens in a pile next to the board. This is the supply. Each player takes 9 coins if playing with four players, 11 coins with three, and 14 coins with two. 1. Players bid to see who will be the first player. Each player picks up his coins and secretly chooses a number to bid by placing them in a closed fist and holding the fist out over the game board. When all players are ready, all players reveal the amount they have chosen to bid at the same time. The player who bids the most coins puts them in the supply. Other players do not pay coins if they lost the bid. If the bids are tied for most, the youngest player wins the bid and pays his coins. If all bids are zero, the youngest player goes first. There is only one bid per game. 2. Starting with the first player and going in clockwise order, players take turns taking one of the face up cards. When a player takes a card, he places it face up in front of him. He must pay the appropriate coin cost for the card depending on where it is in the row (this cost is listed on the "Card Cost" card). From left to right, these are the coin costs of the cards: 0, 1, 1, 2, 2, and 3. For example, if a player selected the third card from the left, he would pay one coin. The number of armies shown indicates how many the player may place. You may place them only on the starting region or on a region where you have a city. Armies need not be placed all in the same region. The number of armies shown indicates the amount of movement the card gives you. For example, this action shows 3 armies, so you could move one army up to 3 times, or 3 armies one time each, or 1 army two times and another army one time. If you want to cross the dotted lines over oceans, it costs 3 movement per army. Place a city anywhere on the board where you have an army. Regions can contain more than one city from any number of players. You may remove an army from the board belonging to any player as long as you have one or more armies in the same region. If there are two different actions on the card with an "or" between them, you may choose which action to perform. If there are two different actions on the card with an "and" between them, you may perform both actions, but must perform them in the order on the card. For example, if you chose the action depicted here, if you wanted to destroy an army, you would need to do it BEFORE building a city. If you are unable or do not want to perform one of the actions, simply ignore it. Note: If a player so chooses, he may take the card and ignore the action. 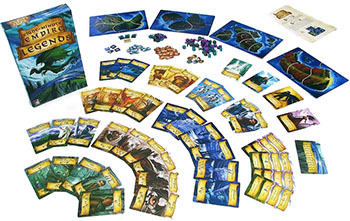 After a player takes his card and action, slide the remaining cards to the left to fill in the empty card space. Draw a new card and place it in the right-most space. Play then passes to the left. At the top of each card is an ability and a name. Abilities are special bonuses that help you throughout the game or score extra points at the end of the game. Once you own a card with an ability, the effects apply for the duration of the game. As soon as you have the card, the ability takes effect, even if it applies to it's own action. Abilites are cummulative. Each time you perform the "move armies" action, you have one extra move. Each time you peform the "place new armies on the board" action, you gain one more. Each "flying" ability you own reduces the cost to move over water by 1, to a minimum of 1. For example, if you have one "flying" ability, the cost to move over water is 2 per army. At the end of the game, the player with the most elixers gains 2 extra victory points. Gain two coins immediately as a one-time bonus. At the end of the game, gain 1 extra victory point per card you own with the specified name. Gain the specified amount of victory points at the end of the game if you own the specified set. +1 Vp Per 2 Coins. At the end of the game gain 1 extra victory point per two coins you own. The game ends when each player owns a certain number of cards depending on the number of players. Players now count up victory points in their heads. 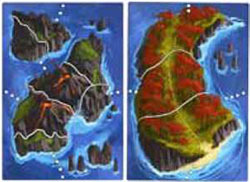 Regions: A player gains one victory point for each region on the map he controls. A player controls a region if he has more armies there than any other player (cities count as armies when determining control). If players have the same number of armies in a region, no one controls it. 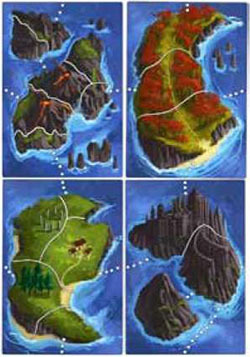 Continents: A player gains one victory point for each continent he controls. A player controls a continent if he controls more regions in the continent than anyone else. If players are tied for controlled regions, no one controls the continent. Abilities: A player gains victory points for any cards with abilities that give extra victory points. The amount of victory points depends on the conditions of the ability. For example, if the ability said "+1 VP per cursed card", and the player had four cards with the name "Cursed", then the player would collect 4 extra victory points. Elixers: The player with the most elixers gains 2 extra victory points. If two or more players are tied for most, the tied players recieve 1 extra victory point. 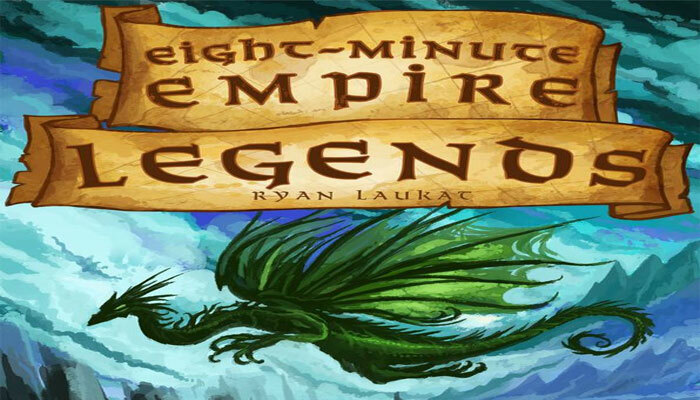 The player who has the most victory points from regions, continents, and abilities has the most powerful empire and is the winner! If players are tied, the player with the most coins wins. If still tied, the player with the most armies on the board wins. If still tied, the player with the most controlled regions wins. Full Game: For a longer experience, play three games. The player with the highest sum of victory points from all three games is the winner. Magic Spring: Gain 2 elixers. 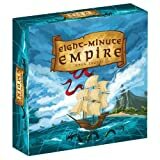 Cottage: Each time you peform the "place new armies on the board" action, you gain one more. Hidden Treasure: Gain one coin immediately. Magic Book: At the end of the game, gain one extra victory point. Also, if tied for points at game end, you win regardless of tie-breakers. Stable: Each time you perform the "move armies" action, you have one extra move. (Stretch Goal) Citadel Tokens: During game setup, the player chosen to set up the board places the three citadel tokens face up on any region on the board that does not already have a token. At the end of the game, control of these regions is worth 1 extra victory point. Alternate Bidding Tie Breaker: Instead of the youngest player winning the first-player bid when tied, roll a die to see who wins.